Do we have a running leopard? There is also the dilemma of typical cat footprints with claws showing on stable ground. This is either a genetic deformity, or an unknown type of cat, or a cat similar to the cheetah. It could also be a hybrid or designer cat bred for the purpose of running or hunting there have been sightings of living and dead animals which resemble unknown cats and have the appearance of a mastiff dog. These ideas may be far fetched but we cannot rule them out, until we learn just what they really are. Most cat species walk with their claws sheaved for protection, and indeed most cat tracks in the UK would suggest this normality, but some without doubt are strange. It may be, that through all this research, trackers have noted that dog footprints are not exactly text book types, or that the modem breeds of dogs are slightly different in the foot, and field guide books regarding dog footprints and other mammal signs will have to be amended. Another type of field sign I am often finding are tree scratchings, but again these can be very problematic, as other native and none native animals do them. The most likely animal is the roe deer, of which males are very territorial at certain times of year, and routinely score and fray small trees in their area. Antler velvet being rubbed off is done in particular fashion, and damage is easily recognisable. But scoring can look like cat scratching, and is usually low down on the trunk. Anything above one metre becomes less likely to be roe. The animal has more control over its antler aiming when the head is lowered. Deep thin score lines in batches of two or more the same depth along the line would indicate cat claws. Roe also rake out a small patch of area at the base of the tree. Some cats do the same, if only to overlay their markings on top of the deer's Cats also put these marks high in the trees or at a height in which another cat would naturally see them. They can also do them on the ground, often accompanied with urine; mostly though a cat will spray bushes, fences, tree trunks and anything else within its territory. We have been without apex predators for such a long time that is wildlife has become unhealthy and prey species have multiplied to unnatural numbers. Big cats restore the balance. It will take a long time before we see the benefits, but it has already started.There is a problem with livestock being taken though. Hundreds of sheep and a few cattle and horses are taken every year, although not in the great numbers some people may think. Many killed sheep are the product of loose dogs, and cats should not be blamed in many circumstances. The media has a responsibility not to sensationalise issues to the extent that every 'ripped apart' or savaged sheep is a product of the beast of whatever. Think what little red riding hood has done or Peter Benchley's 'Jaws'. The public must be told only the truth, and good education is the best way of getting the message across. Big cats pose little threat to humans, and so far no human has knowingly been killed unless there has been a cover up) but there is the potential for them to be man eaters. This would only happen if the cat was injured and could not catch the normal faster animals, but turn to slow less sensitive humans. These animals must not be shot or trapped or killed in any way. Those people who do are not aware of the possible consequences. An injured cat can turn man eater or domestic animal eater, or if a mother with dependent cubs is taken out, then they could either starve or turn man or domestic animal killers. Yet many have been killed At is illegal, foolhardy, and very morally wrong for any body to kill any of these cats. The government must publicly acknowledge there existence and fund official projects to research these animals of which are endangered in other lands. Any conspiracies to hide the truth will only do harm, to the cats, the people, and the long term reputation of Defra, Natural England and central government. I welcome any reports or photographs of big cat activity in Dorset or its border counties, especially welcome are notifications of any dead body or derivatives , remains of kills of wild of domestic animals, (of which I can easily tell cat, from dog kill) and give advice on any subject relating to the big cat phenomenon. Click here for my contact details. 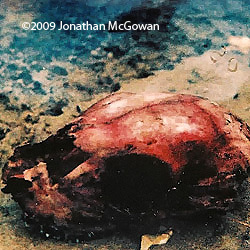 The photo shows a freshly licked deer skull.